I just read an article on Marketing Prof’s about a technique that will make it easier for you to get more likes, shares and maybe even some more music and merch sales. To explain, I am going to reference physics (please note that I am really not this smart but this is what came to mind when reading this article). Anyway, if you’ve ever had a basic physics class, you might remember something about Newtons First Law that says that objects in motion tend to stay in motion, the same is true for consumers online as well. Once you get someone to take an action, you have a nearly 100% chance to get them to take another action immediately following that action. For instance if you have a mailing list and you get someone to sign up, there is a very good chance (nearly 100%) that you can get them to do something else immediately following the sign up. Something like, “Like” you on Facebook or Subscribe to your YouTube channel or share your music with 3 friends. The list is endless. Hell, if you really wanted to go for it, you could offer an album or piece of merch for a special price that they can only get if they take action right now. I think you get the picture (if not hit me up in the comments or shoot me an email). Implementing this shouldn’t be pretty simple if you are using a quality email service. The two email services that I use – Mailchimp and GetResponse (Free Trial for You – Kick Back For Me) – make it very easy. You would just need to insert your message and a link (or code) into a “Thank You” or “Confirmation” page or message. 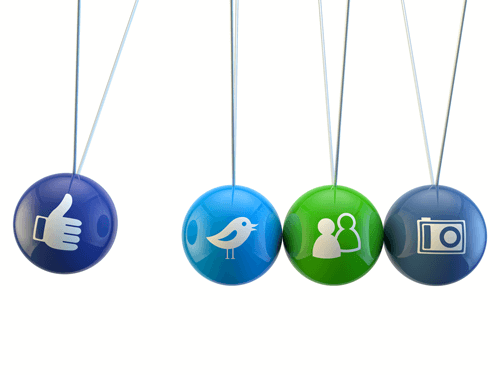 You should be sending all your traffic from your social networks and websites to a page similar to this. After they sign up (or confirm their email), they are taken to page like this. This is a page I whipped up quick to give you a visual. I am only showing Twitter and Facebook here BUT you can add a link to pretty much any social network like YouTube or Instagram for Instagram. Depends on which comminuty you are looking to build the fastest. You can also add actual Like, Share and Subscribe buttons as well. I’ve even set it up so new subscribers are presented with links to all the places they can buy my music and/or merch for a limited time discount. You can set something up just like this if you know your way around your email provider and you website. I created these pages in about 5 minutes using templates provided within GetResponse (free trial for you – kickback for me). If you want a deeper explanation as to how and why this works, here is the Marketing Prof’s article. They break it down very well. Otherwise, let’s chat about it in the comments below. What are your thoughts? How can you use this technique? 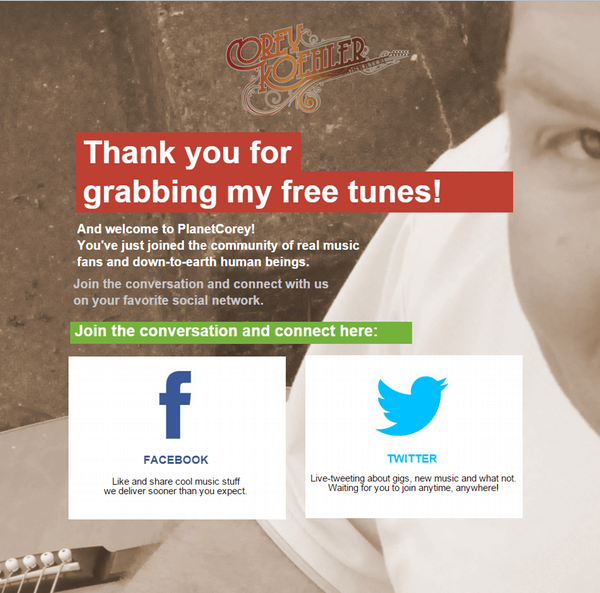 If musicians are not using CTAs (Call to Action) on their websites already, they should definitely be doing so. Too many CTAs on social media can get irritating fast, but if someone has opted to visit your website, it is more than advisable to get them to sign up for your newsletter and grab them before they leave never to come back. One (or two) CTAs per page are acceptable. Any more than that, and you will confuse your visitors. You know what you want your users to do, so guide them in the right direction. Good association “Newtons First Law that says that objects in motion tend to stay in motion, the same is true for consumers online as well” it’s spot on for the good web marketing practice! Also, if you are looking for fan …help them find you! Use as many music platforms and profiles as you can! Hey man just wana say thanks alot writing these articles up it has really helpedin the ddirection im trying to take. I really appreciate it man. Glad to hear Henare. Good to know this stuff is helping others. Corey, how are you using Mailchimp and Get Repsonse? I have Mailchimp, but I like the landing page feature in Get Response. Hi Shawn, Thanks for stopping. Can you be more specific on how I am using Mailchimp and GetResponse? Not sure what you mean. I use Mailchimp for Musicgoat (this site) and GetResponse for my music. I would use GetResponse for both but I am dug in pretty deep with Mailchimp. It would take a lot of time to move with all the working parts. 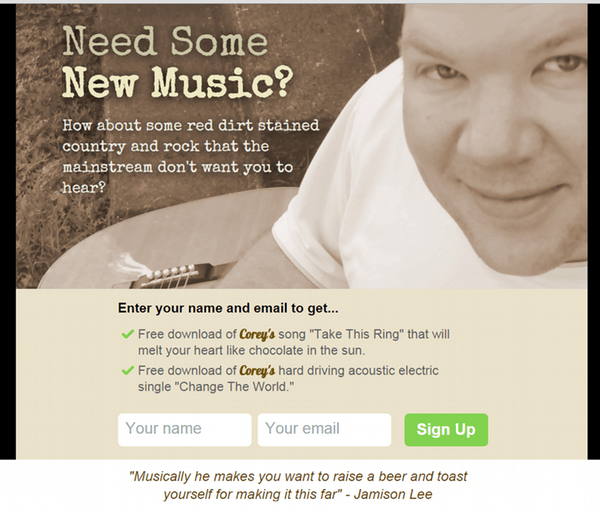 I found GR when i was looking for a email solution that I could use to show musicians how to start an email list without needing a new website or making significant changes to their current website.